Bold360’s customer engagement solution can power personalized customer interactions across the web. On your site, app, and across social media channels, Bold360 serves up unique customer information and offers relevant suggestions for each user. Our solution can integrate with all of your 3rd party systems, like CRMs, billing tools, and order management systems, so you can show your customers information that matters to them. 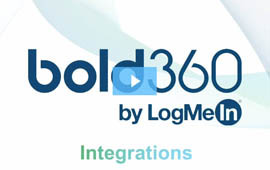 Unlock the power of your existing business systems with Bold360.